The Palamau Tiger Reserve is among one of the nine original tiger reserves in India and the only one in the state of Jharkhand, India. The reserve forms a part of the Betla National Park. The area in Palamu District in Jharkhand was set aside as a protected area in 1947 under the Indian Forests Act. Earlier, the area was used for cattle grazing and camping and the area was acutely prone to forest fire. In 1974 the area was set up as the Palamau Tiger Reserve. 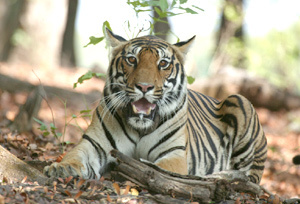 This tiger reserve has a total area of 1,014 sq kms with a core area of 414 sq km and a buffer area of 600 sq km. The core area is accosted with some of the forest villages like Ramandag, Latoo and Kujurum. Most of the villages are small in area where one of the villages, Meral, consist of just 99 acres of land, 9 families and 78 members. In 1993, there were 45 villages located in the buffer area and about 60 more located in the periphery of the reserve. As per the 2012 survey, those ranges accented to 136 villages to fall under the "buffer area" regulations of the Palamau Tiger Reserve. Only seven of the villages were in existence in 1923. The villagers have no legal claim to lands that were settled after 1974 when the buffer area for the reserve was created. Palamau Tiger Reserve was established when India was introducing the famous Project Tiger in the year 1973 to save the endangered asset of our country. It was believed that with the introduction of this reserve the endangered species of tigers along with other wild counts would be preserved and cared under the Wildlife Protection Act. Year ago before the establishment of Palamau Tiger Reserve, the management of these forests was highly commercial. There were some cattle camps and the area was open for grazing. The entire forest area used to be ravaged by fires every year with the unchecked activities of poaching. But today, the present area of the Reserve got duly constituted either as Protected Forest or Reserved Forest under the Indian Forest Act, 1927 way back in 1947. The Palamau Tiger Reserve falls under the lndo-Malayan realm and is distinguished for its flora and fauna. The predators that roam the forest grounds are tigers, leopards, wolves, wild dogs and jungle cats. Among the herbivores, sloth bear, four horned antelope and mouse dear are the duly residents of the area. Interestingly the first ever tiger census by way of pug mark count, was undertaken within these forests in 1934. Since the first census, population of tigers showed a steady decline till 1972, when their number dwindled down to 17. However, after the declaration of the Sanctuary, it is stated, the number showed a rise reaching a figure of 55 in 1989. The 1991 census figure shows the tiger population as 54. This figure quoted by the Palamau Tiger Reserve authorities is purely indicative and not absolute. The population of elephants in Palamau has increased substantially during the past 50 years. Prior to 1920, this area had no elephant population but the 20 odd elephants released by the Maharaja of Surguja turned feral, subsequently increasing in number. 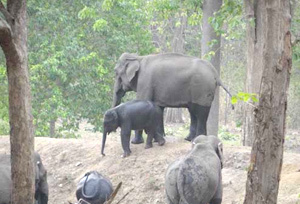 The present elephant count exceeds 104 elephants which show addition of herds from the Singbhum district of Bihar. The major wildlife species (mammals) witnessed in the area is: Tiger, Leopard, Sambar, Barking Deer, Cheetal, Wolf, Elephant, Mouse Deer, Wild Dog, Four-horned Antelope, Pangolin and Indian Ratel. The vegetation in Palamau region comprises of moist deciduous and dry deciduous forests to include Sal and bamboo as the major components. The western part of the Reserve is composed of dry deciduous forests and the other part shows characters of moist mixed deciduous nature. The entire area has a good distribution of bamboo thatches. The herbarium recently prepared by the Tiger Reserve authorities records a good number of medicinal plants. Betla National Park - The Betla National Park, situated on the Ranchi-Daltonganj Road, is flourished with forests, valleys and hills. This national park is home to around 39 species of mammals, 180 species of medicinal plants and 174 species of birds, along with major reptiles. Animals such as nilgai, mouse deer, antelope, sambar, sloth bear, panther, python and langur can be seen in the park. The park has more than 970 species of plants and shrubs, majority of them possessing medicinal properties. The best time to visit the park is between the months of February and March. 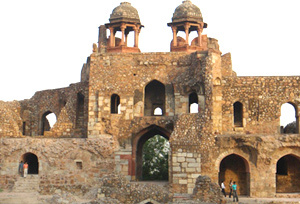 Purana Qila - Palamu Fort has two forts -- the Purana Kila, also known as the Old Fort, and the Naya Kila, the New Fort. These forts were elevated during the beginning of the Mughal period by the Chero chiefs Medani Roy and Pratap Roy. Located along the Auranga River near the Palamau Tiger Reserve, these forts serve the best site for archaeological survey. The Purana Quila is around one km in circumference and stands on terraced grounds. It also has a cross wall which divides the lower and the upper parts. There are four fortified gates along with watchtowers in this fort. Lodh Waterfalls - The Lodh Waterfalls, also known as the Buddha Ghagh Waterfalls, is the inflows of the Burha River. It is situated 12 km away from the Lower Ghaghri Waterfalls and has a height of around 143 m.
Shahpur - Shahpur Village is located on the banks of River Koel and is famous for a white temple and sandstone buildings. These structures were constructed in the 18th century by the King of Palamau, Gopal Rai. Deoghar - (Baidyanath Dham)Deoghar is the most sacred spiritual place in the area of Santhal Parganas of Jharkhand. Also known as Baidyanath Dham, it is a very important pilgrimage centre. It's famous for the Hindus for the temple of Shiva-Baidyanath and the place is also a popular holiday Center. Netarhat - Popularly known as the `Queen of Chhotanagpur', Netarhat is 154 km west of Ranchi Town. This is a famous plateau covered with thick forests situated at a height of 3,700 feet. This site is famous for awesome sunrise and sunset to collect mass attention of the tourists. Besides, the tourists can also made a finest excursion towards Dhanbad and Ranchi, the capital of Jharkhand; where Dhanbad is best known for grand coal mines and Ranchi is the perfect land to witness many natural falls for a great natural escape. Daily game drives in Open 4WD safari vehicles are available to visit the Palamau Area. The park opening time is round the year. Safari Timing – 06:00 AM to 08:00 AM and 03:00 PM to 06:00 PM. Palamau does not have a train station, and the nearest station is Dhanbad, at a distance of 245 kms from Palamau. Palamu Tiger Reserve is located in Palamau district 25 km away from city headquarter Daltonganj which is also the nearest railhead and offers trains to all important cities of India. The capital city of Jharkhand, Ranchi is the nearest airport and you can access air service to all important destinations in India. The park is extensively connected with Betla with a distance of 26 km and all nearby cities in the state. The best time to visit Palamau is during January to June. For the most natural accommodation, the Palamau National Park offers tree houses in the heart of park. There is also food arrangement in these tree houses. There are many good hotels available at Daltonganj. Ranchi, the capital city of Jharkhand is just 161 km away from the park and has all categories of hotels to be filled with ample accommodation and gradient services. Additionally, the tourist lodges in the park vicinity has greatest importance for much closeness and pleasure stay.